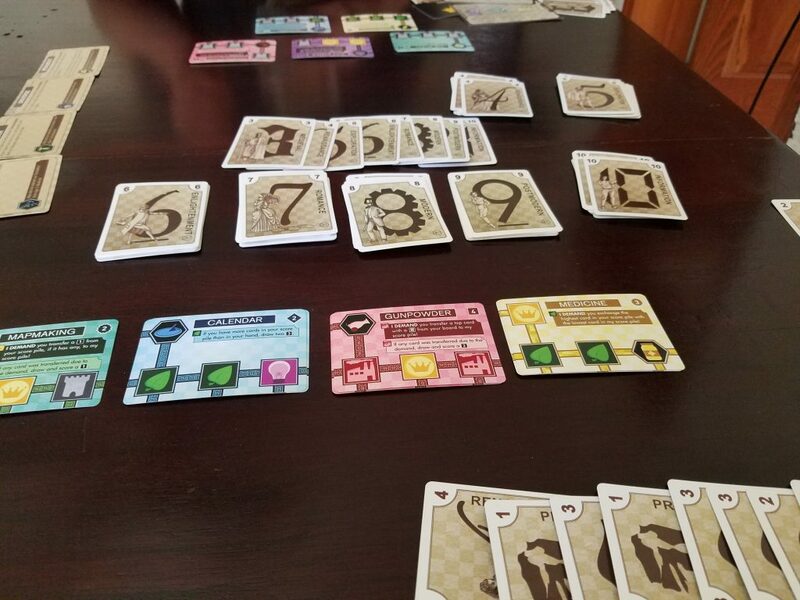 I don’t know what Carl Chudyk looks like, but I picture him in mad scientist garb, cackling over card templates as he conjures up his latest game. He’s a designer who definitely has a style, and that style is dense card games that look like they shouldn’t work but somehow generate extremely devoted fans. Glory to Rome is a game of myth and legend, although I suspect that’s partially due to all of the legal squabbles surrounding it resulting in it being perpetually out of print. I’m sure the people who enjoy it actually enjoy it, but still, I don’t think it would get talked about as much if it was on the rack at every FLGS. If you ask a random boardgamer what Chudyk’s best game is that isn’t $500 on the secondary market, they’ll probably tell you Innovation. 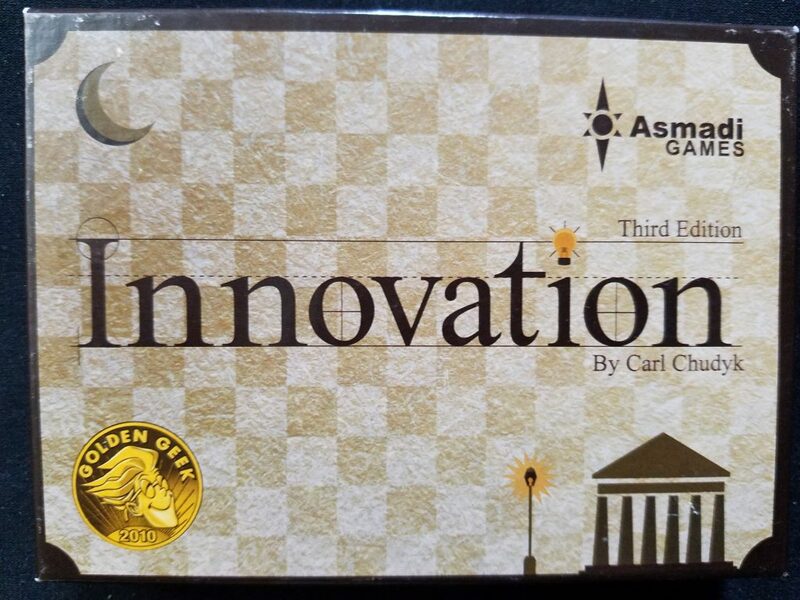 Astute readers will remember that I had an absolutely miserable time with my first play of Innovation. I never moved past the 2nd age while Matt managed to spiral into a quick victory. I was ready to be done with it but Matt, high on the smell of victory, thought it was worth purchasing. Silly Matt. Turns out his instincts were correct, because Innovation (to borrow a phrase from the Brits) is a real banger. In fact, it might be my favorite small box 2 player experience of the past couple of months, perhaps excepting Tak. This change of heart doesn’t invalidate my prior experience, however. Innovation is certainly a game where one side can completely run away with a victory, leaving their opponent squabbling about in the dark ages (literally). What’s the difference now? Have I turned into a big softie, eschewing the principles that have turned this humble site into an international phenomenon? Has my crunchy crust cracked, exposing a gooey inner layer that hands out positive reviews willy-nilly like those folks who happen to appear on every single Kickstarter campaign page? I don’t think so. Also, gross, imaginary question-asker. Hear me out–Innovation sits in this weird niche of game that’s both complex and silly. It’s for people (like me) who enjoy games where everyone sits around staring at rows of symbols and/or text, occasionally muttering “hmmm” before delicately moving a cube. It’s also completely bonkers, reminding one of games like Cosmic Encounter or Fluxx. It’s Exploding Kittens for heavy gamers. I can see the skeptical furrows on your forehead. I’m not selling this well. How could I? Innovation is such a contradiction along its entire length that falling for its charms must look like some kind of cultist snare to the outsider. It starts innocently enough. You get a card in hand and a card on your tableau. Before you are 10 small decks, one for each of the 10 ages of (western) history that Chudyk decided to use, probably because 10 is a fun number. On your turn you get to perform two actions out of four available. You can draw a card, play a card to your tableau, or score an achievement once you hit certain point-scoring thresholds. So far so simple. The fourth action type is called a “dogma” action for reasons unclear to me, and it’s where Innovation spins into madcap insanity. Every card in the game has a unique dogma action on it, and they range from powerful to VERY powerful to “kind of insane if you can make it work”. Maybe a card will let you draw from the deck one age higher than you would otherwise be able to tap. Neat. Another may let you discard three cards from your score area to draw from an age three higher. Is that worth it? I have no idea. Give it a shot. Go nuts! Innovation succeeds where other Chudyk designs I’ve played fail in the realm of counterplay and having a narrative to the game other than “one person spirals out of control and wins”. The primary tug of war is over the 4-6 symbols in play at any given point in the game. Every dogma action has a particular symbol associated with it, and if your opponent has the same number or more of that symbol displayed on their tableau they get to take the action first. The dogmas are deliberately designed to be very situational, so you need to pay attention to the board state and think through the actual consequences of what you’re attempting to do. There’s also the matter of evaluating your tableau of symbols as they relate to your ability to actually win the game. 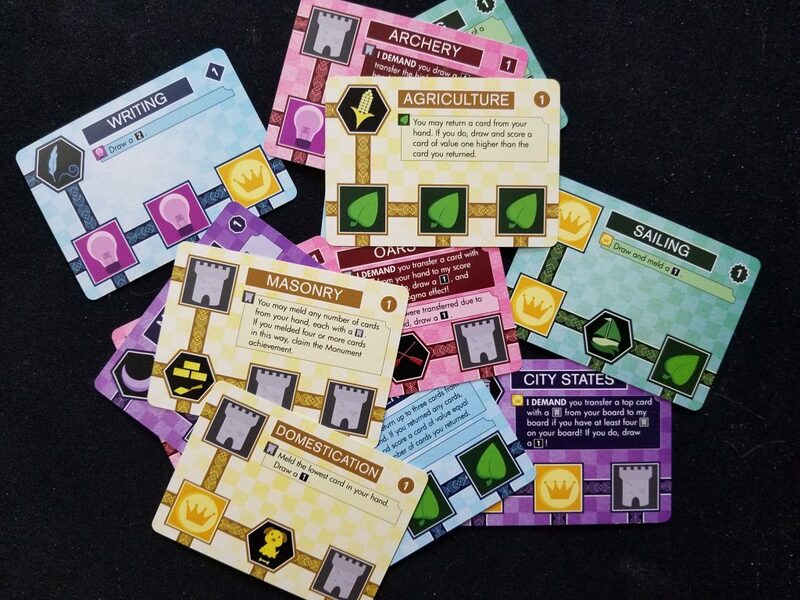 A beefy tableau acts as a kind of soft power on your opponent–it makes their lives harder and gives you more flexibility, but it’s tangential to scoring points and gaining achievements. Scoring opportunities come through cards that often have you sacrifice something (at the very least time) in order to get those points. If your opponent lets you have those first couple achievements they’re going to be bulking up for the late game, and that naturally progressing strategic asymmetry is compelling. There are a few other nifty nuggets to be found in Innovation, most from the rule that when a deck runs out of cars and you’re supposed to draw from that deck, you instead draw from the next highest numbered deck. Exploiting this to ridiculous effect makes up the bulk of the middle game, which means that you’re often trying to simultaneously foil your opponent’s attempts to skip ahead. Sometimes you’ll be faced with the option of sacrificing a bit of card advantage in order to seed a lower deck and give your enemy a card power disadvantage. Sometimes that may backfire as cards that appear in the early game can take on new, powerful meaning when decks 1-6 are drained. I’m making Innovation sound like a serious tactical game. I mean, it is, I suppose, but it also isn’t. When I play I’m thinking all of the good 2 player card game thoughts regarding tempo and flexibility and board (symbol) control, but I’m also waiting for a single card to make me rethink all of my carefully laid plans because I need to exploit its ability ASAP. I’ve played Innovation quite a few times and I don’t know if I’ve made any progress on actually understanding the deck. I should probably get around to that at some point to see what kind of tricky bluffing depths might be there, but I also don’t really want to. When you’ve been around the board game scene for a minute you start to see repeating motifs. Especially as a reviewer, I’m quick to identify the parts and assemblage of new games I play and I pride myself on a relatively keen ability to predict what I’ll like and dislike about a game over the long run. When a game comes around that defies that reductive “pile of mechanisms” quick take I perk up a bit. Innovation has so many similarities to other games, but it’s so enthusiastically itself that I can’t entirely pin it down. Will it still be good when I get a better grasp of the cards? Probably. But I’m relishing where I’m at right now with the game where every play has the potential to actually surprise me. It’s taken that wonderful discovery process you get with new games as you suss out their secrets and extended it at length. Every time I draw a new card from any of the decks it’s like I’ve never seen those cards before. Maybe I’ll have some memory of its ability, but I haven’t seen it paired with this other card, or in this particular game state context. Innovation is perpetually fresh. I wish I could say the same about the visual design, which could be described as plain at best (I’m playing with the Asmadi version). It’s about as functional as it can be in trying to communicate sometimes dozens of symbols across a table in the mid/late game, but it’s not a looker by any means and it’s still hard to keep track of who exactly is winning in a given symbol arms race. Even more difficult is keeping track of all the abilities your opponent has available to them at any time. Yes, there are a maximum of five at any time, but they change so frequently that even moderately competitive play will result in a lot of, “what does that card do?” I suspect Chudyk took such feedback in playtesting and threw it out the window in favor of his vision: a card game that’s simultaneously dense and ridiculous; a game that walks right up to the line of “too far” and dares you to tell it to stop. And you know what? Even if it does go too far the good experiences I’ve had with Innovation render that mostly irrelevant. I love this game on Boardgame Arena, though I’ve never played it on the table so I’m not sure how I would be having to keep track of all the symbols and how many each of us has. I was playing a game on BGA, and he had double digits in all but one of the symbols. He outclassed me in all of those. But I’d been hanging with him in achievements, and we were tied 5-5. The one symbol that I was ahead of him on, I had a card that would let me whittle down his top cards and his scoring cards, and it also allowed me to score enough to get the 6th achievement. When I was looking at it each turn, seeing that he had (for example) 24 light bulbs, I figured I was going to just play the game out until it ended.